Just about every investor clamors to hear from Apple(AAPL), and Facebook(FB). Since only Facebook is in the portfolio I'll only be commenting on that one. Sorry!! net income increased 75% from $1.74 billion to $3.06 billion. You like to see income growing more than sales since it means more of every dollar falls to the bottom line. That's a sign of a great cost structure and business. DAU's were up 18%, and MAU's were up 17% to a staggering 1.94 billion accounts. The company has $32 billion worth of cash on hand, which is bigger than the market cap for 99% of all companies. The stock is taking a dip of about 3% after hours. We will see what Thursday's trading brings. 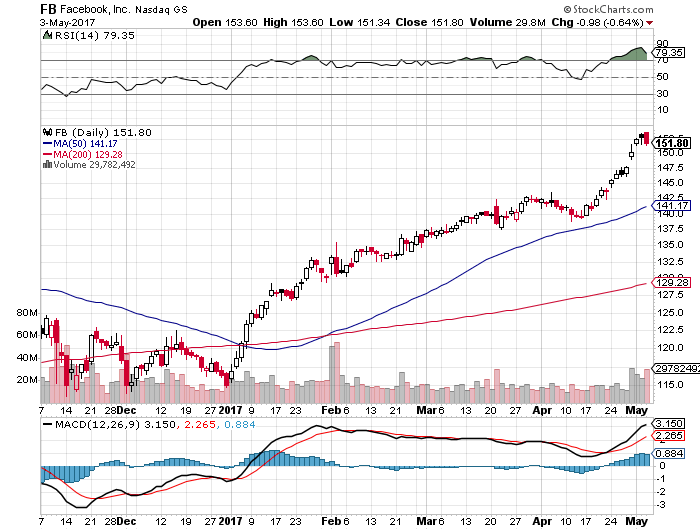 The stock was getting overbought on the daily chart so maybe it was just a matter of timing.